This was a pub on our, "TO REVISIT" list. We ate here several years ago, before we started reviewing. 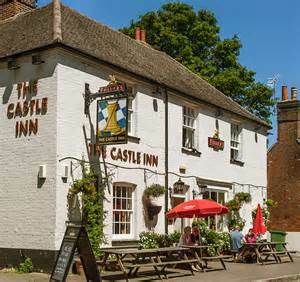 After passing through said pub for a few drinks at the weekend, I declared that today would be the turn of The Castle Inn. This is very much an oldie world pub, with beams, scrubbed floors and tables, and two seporated bars. There is a garden out the back, next to the car park, as well as a few tables out the front, although this does involve sitting by the road. Although we weren't greeted with the warmest of welcomes, our drinks order and questions regarding lunch were rudimentarily answered. As the sun had chosen to shine upon the green green grass of Rowlands Castle, we took a seat outside to discover our foodie fate. This wasn't a bad menu, with several meals of interest. Mains were ranging between £10.95 and £13.95, not including the steak option. My choice was a garlic and herb chicken breast in a bun with skinny fries, (chips), and homemade coleslaw. Dad's lunch today was to be the pie of the day, which this day, was steak and ale. The pub wasn't busy, so it wasn't long before our food was served. It all looked pretty good. I know you're wondering, and the answer is yes, the pie was a real pie, with pastry on all sides. It was literally a slice of pie taken from a giant round pie, which we both liked the idea of. We truly are simple folk. By all accounts, the pie was delicious, and was joined on its plate by new potatoes, carrots and broccoli, which were all cooked well. My chicken breast was very well done, by which I mean it had been prepared well. It was tender and juicy, filling the bun nicely. The skinny chips were as they should be, and I was also fortunate enough to have my very own little pot of homemade coleslaw, which was nice. We certainly couldn't grumble about the food here, it was actually quite good. The general atmosphere in the pub could have been helped with a splash of friendly music, and the customer relations could do with a slight polish, but on the whole, we enjoyed our trip to Rowlands Castle, and in particular, The Castle Inn. At the time of writing, there are three functioning pubs in the village, all of them very different. It only takes a few minutes to walk past all of them, so see what you fancy and take your pick.